Happy Labor Day! I hope you are enjoying the day in your favorite chair and relaxing. I am. I’m outside, soaking up some heat and some sun and working on my Trickery for the Knit-a-Long. And I can have Blue Bell ice cream whenever I want. 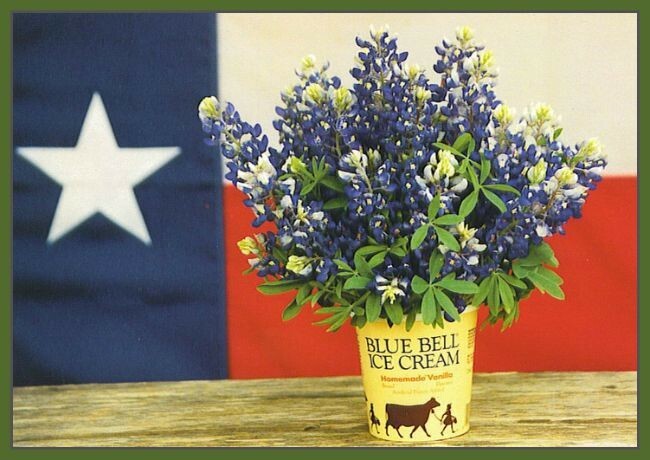 Blue Bell is a popular favorite, so popular its an unofficial state icon. That picture at the top of this post? Its a postcard you can find in every tourist gift shop in Texas. We got our state flag, we got our state flower, and we got our state ice cream. A few months ago Blue Bell ice cream had a listeria outbreak, followed by a voluntary recall and they pulled absolutely everything off the shelves. 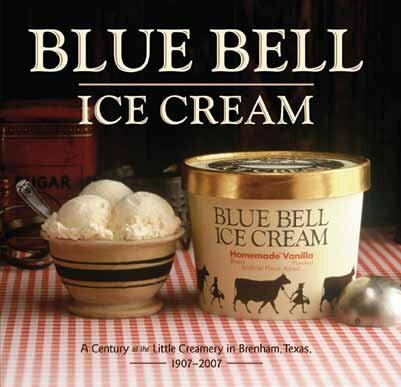 This was the summer of no Blue Bell. That meant for some mighty sad Texans. But it was gone for a really long time. All summer in fact. I was calling this the Summer of No Blue Bell. How good is this ice cream? Well, I eat it. That might not sound like much of an endorsement but it is. I can’t stand the cold. Cold weather, cold air, cold drinks, they all make me ache. I’m probably part lizard because I keep my home at 85 degrees F (that’s 29 deg C for all you metric system lovin’ readers) and that’s where I’m comfy. Eating a bowl of ice cream gives me the chills I have to wear a coat afterwards to warm up but Blue Bell is worth it. Back in July, on a nice warm day, I was having ice cream thoughts. So I went to the grocery store to look at the ice cream section. I knew there was no Blue Bell in that store but I was having a weak moment. In the ice cream isle I found one sad looking fellow. He was wearing shorts down low so the world could enjoy seeing his underwear. He’d paired it with a wife beater t-shirt. Every visible inch of his skin from the neck down was covered in tattoos. And he was staring forlornly with slumped shoulders into the ice cream freezer. “There is no Blue Bell”, I told him. “Yeah, I know” he said without even turning his head to look at me. He stared into the freezer for a bit longer and then opened it. He took out a tub of not-Blue Bell. “Is that any good?” I asked. “No,” he said and left with his not-Blue Bell. I bought what he bought. He was right. It wasn’t very good. BUT, last week I was back at the grocery store and a man walked by me and he had Blue Bell ice cream in his cart. That sent me hot-footing it over to the ice cream isle. I went right to the center of the isle, which is where they always put the Blue Bell. But the Blue Bell was not there. Maybe they moved it, I thought. I walked up and down the whole isle. But the Blue Bell was not there. Maybe they only have a very little bit of it out and you just didn’t see it, I thought. I walked up and down the isle again. But the Blue Bell was not there. Maybe you have lost your ever-living mind and started to hallucinate, I thought. But just to be sure I walked up and down very slowly one last time. The freaking Blue Bell was not there. I left the isle feeling disappointed and pouty but down at the end, facing out into the big walking isle, was a freezer case with completely fogged up doors. You know how a store freezer gets when the doors have been opened too much and you can’t see a thing inside it? It was like that. Maybe just maybe, I thought. I pulled open a fogged up door and there before my eyes was the Blue Bell. That moment felt so magical it should have had a soundtrack. So I bought my half-gallon tub of Cookies and Cream and went home and had a very yummy bowl of ice cream. Finally. Then I took a really hot bath to warm up. And none of them told me. They were keeping it from me. They didn’t want me to know! Here is the thing: Blue Bell is currently being rationed. Yep. There is an official limit of four per customer and I hear some stores will only sell two to a customer. We Texans love Blue Bell and thousands of us are competing for the stuff. Which is why no one told me Blue Bell was back. I completely understand. 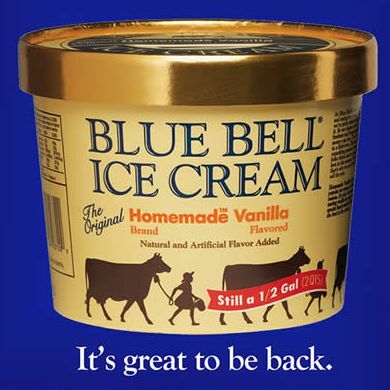 If didn’t already have Blue Bell in my freezer, I wouldn’t be telling ya’ll that Blue Bell is back. But I do and it is. If you can, go get some. Trickery Knit-a-Long! Starting the Center → ← Long Draw Spinning – its how pro spinners do it! 24 Comments on "We Texans Got Our Blue Bell Back"
Ummm, even I knew that Blue Bell was back (in Tennessee), BUT their Frozen Fruit Bars (and specifically Strawberry) are not! Do you have any insider/Texan’s knowledge of when they might start making/distributing these? I love them so very much; the competitors’ similar products are simply no good. Nope I have no insider info. Right now there are only 4 flavors of ice cream out. I thinks its four. And no Moo bars, which is of concern to several people of my acquaintance. They love those Moo bars. I have heard that as of a few days ago the factory in Oklahoma is back up and running. Maybe they make the fruit bars there. But I will keep and eye out! So.. I’ll add you to the list of people who knew and didn’t tell me. huh! I’m sending you some in this reply. I’ll just pour out a little half-melty ice cream on the keyboard and hope that it makes it to you. So… I’m going to be completely off topic today because I am so excited… MY GAUNTLETS ARE DONE AND I HAVE PICTURES!!! But totally yay for your favorite ice cream! (I prefer Talenti Gelato it’s gluten-free and sinful). Those are awesome! They come out just lovely. And what a nice pattern. hate computer stuff. Why is it all so complicated!! Soooooo jealous, it’s not just Texans it’s every Ice Cream eatin’ southerner who’s been waiting. We’re waiting here (and not too patiently) in Memphis for our share. I’ll take any flavor but stay out of my way when the Banana Pudding comes back to the freezer case just stand back, I warned ya’ll! Yes to the name. The changed it back in the 1920’s (I think) after the flower. So did you get your ice cream? I’m hoping they will say it’s still available in another country, at which point, I will have to set up an appeal on my blog. And twitter. And ravelry! Sounds like me and my favorite coffee (Calibre). When I couldn’t find it anymore, my mother drove 2 hours one way to buy it for me. Maybe this is the kind of problem your mommy can fix. Maybe.